"PS3 SixAxis Control by eriklely." "AX-18 Mark II with Phoenix Code by eriklely." "Raspberry Pi Mark II by Kevin Ochs." "Raspberry Pi Mark II with Kinect object detection by Kevin Ochs." "Mark I with OpenCV Following a Human by zenithparsec." "Mark I with OpenCV and Raspberry Pi by zenithparsec." "Mark I Offroad by Zenta." PhantomX Hexapod Manual (for reference). PhantomX Hexapod Mark II NUKE Code. 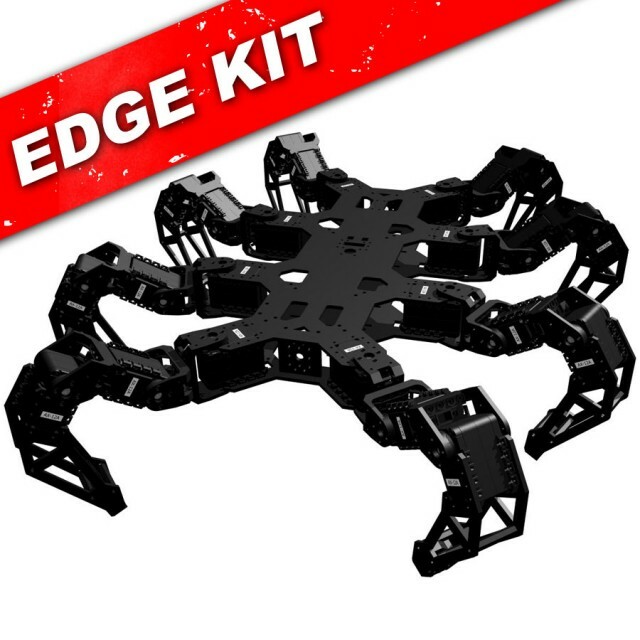 Interbotix Labs is proud to announce this Edge Kit! Edge Kits do NOT come with the same level of documentation, code, and/or assembly instructions that our fully support Interbotix Kits do. As a result, these kits are best suited for individuals with previous experience with these kits or other similar applications. 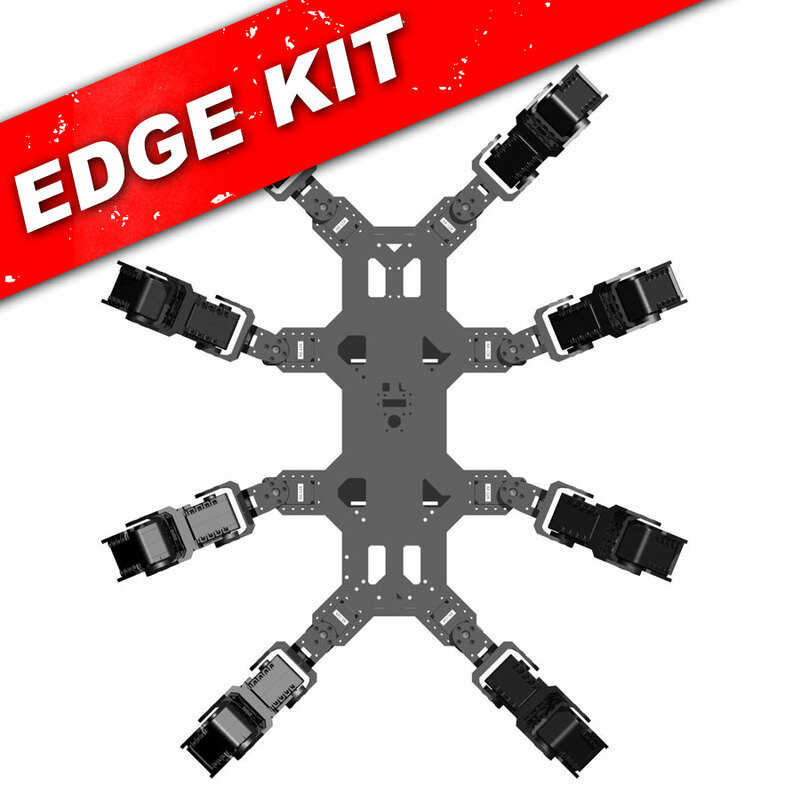 Edge Kits are provided as-is and without support. Often times they are based upon existing kits, so we encourage users to check out surrounding documentation for reference. 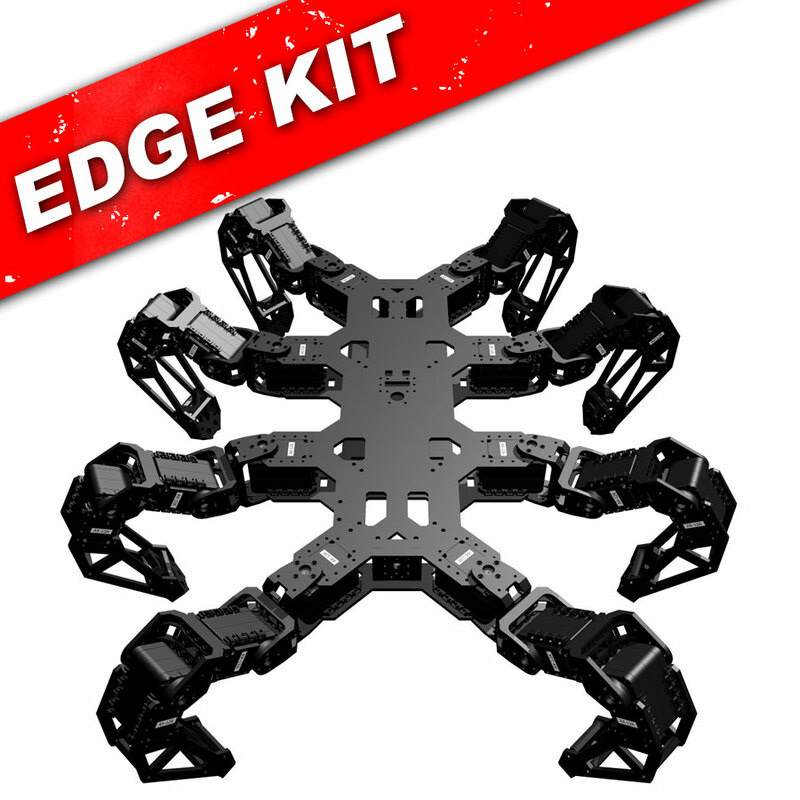 The PhantomXOctopod Edge Kit is a hardware kit (no servos included, 24 AX-12A or AX-18A required) that comes with the bare essentials to get your next 8-legged crawler project going! PhantomXOctopod Hardware & Body Kit. 4x PhantomX 3DOF Leg Pairs. PhantomX Octopod Nut & Bolt. PhantomX Octopod Hardware & Body Kit. PhantomX Octopod Nut & Bolt Kit. 11.1V 3S 2200mAh LiPo Battery. LiPo Balance Charger Starter Kit. USB A to Mini-B Cable. So what's the ArbotiX all about? Unless you've been living under a rock for the last two years, you've likely heard of the Arduino platform. This little Atmel based microcontroller has revolutionized the computing and robotics fields by enabling users to get off the ground and make things blink, whir, buzz, and move with very little programming knowledge. The IDE (Integrated Development Environment) is very simple to use, and the plethora of available code snippets coupled with a huge online community have rocketed this platform into being one of the most popular microcontrollers since the introduction of the Basic Stamp. On the robotics side of things, many of you have likely heard of the AX-12A DYNAMIXEL servos and Bioloid system from ROBOTIS. These are revolutionary robot servos that have a feature list a mile long and performance that has set a new bar for what to expect from a servo. But to many, the TTL serial interface proves to be a bit daunting, and may put some off from taking advantage of this new and exciting technology. The ArbotiX Robocontroller from Vanadium Labs is where these two worlds come together. It is the first dedicated Arduino-Compatible microcontroller built specifically to make controlling DYNAMIXELs a simple and painless process. The open source libraries for the Arbotix literally make controlling a DYNAMIXEL (AX, DX, RX, and EX series) no more complex than controlling a standard hobby servo. But that's not where it ends! 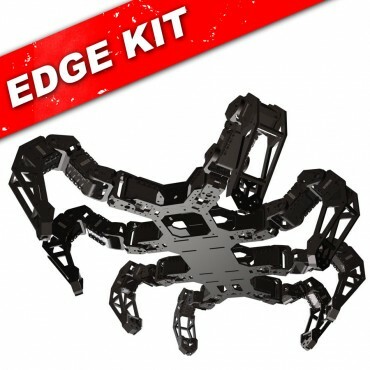 Vanadium Labs has gone to great lengths to develop not only the standard DYNAMIXEL servo libraries, but also a full featured program called NUKE (Nearly Universal Kinematics Engine) that generate inverse kinematics (I/K) and gait engines for various Hexapod, Quadropod, and Bipedal robot configurations! The NUKE GUI features a startup wizard that you can follow step by step as it asks you various questions about your robot. Punch in the length of various limbs and the robot's dimensions, and NUKE will output a ready-to-run Arduino Sketch for your ArbotiX! We've seen countless hobbyists do exactly this and be blown away by the results and just how easy it was to dive in and get started. This system has also become an increasingly popular option for building Mech robots to compete in Mech Warfare! Supports DYNAMIXEL AX-12A or Ultra Fast DYNAMIXEL AX-18A Series Robot Servos(NOT INCLUDED). 8 legs! Supports 24 servos! Add Arms, Grippers, Cameras, Pan/Tilts, even Computers! Wireless Xbee Control via PC or Handheld. Tons of I/O available and fully programmable for autonomy. Great platform for hobby, education, research, and Mech Warfare!